About two years ago I started to spend longer days on the bike. Hundred mile rides were becoming more of a recreational training ride. At this point I started riding double centuries and I actually enjoyed it. I was looking to change my nutrition to natural and non-packaged foods. So I started experimenting with eating just real food on the bike such as bananas, nuts, oranges, and apples. The real food was making me feel like I had more energy and I felt full. However, I was missing something that I could not put my finger on. I did some research on calories, fuel, gastric absorption, and sugar content of foods for my longer rides. I also wanted foods that do not have a high fat content to decrease to likelihood of my stomach becoming upset. So I kept experimenting and a friend of mine gave me a rice cake on a ride. I thought why would I eat this on a ride. Well that initial thought did not stay with me long. I can think now of a bunch of reasons why I would eat rice cakes on a ride. After consuming my first rice cake I was hooked. I then had to find out how to make these scrumptious snacks. 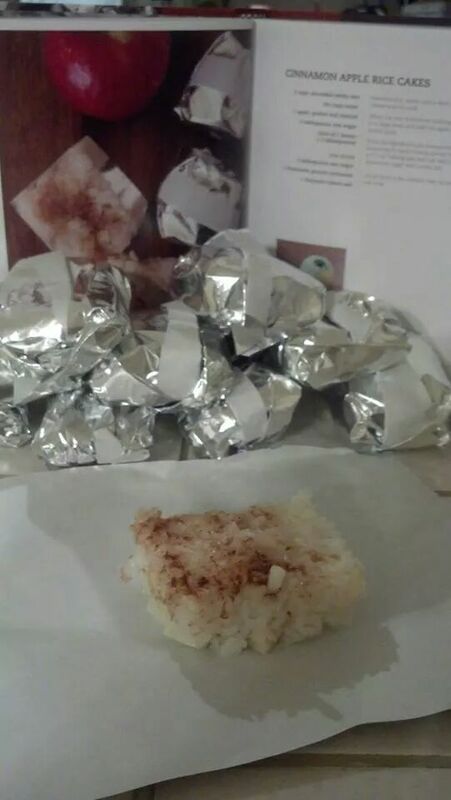 I came across the Skratch Labs –Feed Zone Portables Cookbook and started making some of the simpler rice cakes that were an interest to my taste buds. 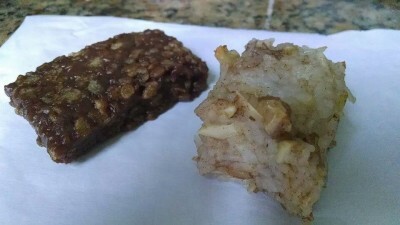 I started making the Apple Rice Cakes then the Mochiko Rice Cakes and later progressed to the Date & Almond Rice Balls. It is difficult for me to decide on a favorite. They stay fresh all day in my jersey when wrapped in the parchment foil. Sometimes If I am taking more than two cakes I will wrap them in the foil and store them in a plastic bag. It seems like I never become bored alternating a main fruit in the Apple Rice Cake recipe. I have made it with Strawberries, blueberries, and raspberries. What I like most about the rice cakes is that they taste natural and fresh. They do not have a processed or cardboard taste. Also they have a higher water content than traditional energy bars, which keeps me better hydrated. From reading the Feed Zone Portable Cookbook I also had a better understanding of nutrition, hydration, and how to increase performance through my nutrition. It actually worked. I can ride 200 mile double century rides, place first solo female, and have no hydration, cramping, or “bonking” issues. I decreased the fat content I was consuming on the bike, increased hydration content in foods and drink, and balanced out my sodium/protein/carbohydrates. I believe that most of this is attributed to the changes I made in my nutrition. I now enjoy eating on the bike when I am working hard and it does not seem like a chore. At first I found the rice cakes a little time consuming to make; except for the Mochiko Cakes. But as I made these weekly the process became less laborious. I purchased a small rice cooker and a sushi mold press; this cut down on preparation time and clean up. With the sushi mold I can make a perfect rectangular block that can be cut into smaller pieces. I found that the sushi mold makes the pieces uniform and there is less mess since I do not have to spread the rice mixture in a large pan and cut the pieces by hand. I wrap the cakes like a present in parchment foil. This serves as a non-stick wrapping to keep the rice cakes moist and fresh. I think it is important to consume foods while participating in my cycling training and events that make me feel good, are of natural/real ingredients, and give me a great deal of nutrition in a compact portable size. I plan on making my own food for my longer training rides and events for years to come. This has really changed my life. Check out the Feed Zone Portable Cookbook at www.skratchlabs.com.